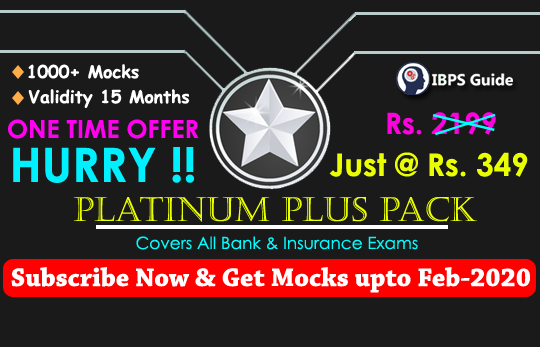 Dear Aspirants, IBPS PO Mains 2018 was over on 18th November, 2018. We have already shared a detailed exam analysis for the same. We know that you all must be eagerly searching for the list of GK Questions asked in IBPS PO Mains. We are here to share the complete List of General Awareness Questions asked in IBPS PO Mains exam. Out of 40 questions, 31 questions were asked from our Power Capsule. We hope that, aspirants who prepared using our Power Capsule would hit the most of the questions in this mains exam. In this post, candidates can find the GK questions with answers that make you to assess your mistakes and rectify it in the upcoming exams. Our IBPS Guide team wishes you a great success in your endeavours. Note: Most of the questions were asked from our IBPS PO Mains 2018 Power Capsule (Page numbers of capsule are mentioned in each question). 22) On the implementation of which scheme UN member countries are expected to present their Voluntary National Review (VNR)? 24) Which bank has signed an agreement with CDSL Commodity Repository (CCRL), thus becoming the first public sector bank to become the repository participant for pledge finance under the repository ecosystem for registered/accredited warehouses? 25) With which department the RBI has asked banks authorized to deal in foreign exchange (Authorised Dealer-I Banks) to share data? 27) For which categorised persons dedicated portals of the ECI’S Systematic Voters Education, the pursuit of its mission ‘leave no voter behind? 28) What is the objective of the ‘Rashtriya Gram Swaraj Abhiyan (RGSA)’? Answer: To strengthen the Panchayati Raj system in the country. Answer: UK, UP, Bihar, WB and Jharkhand. 30) Which state has topped in comprising 70% exports? 35) How much amount did RBI’s new rule has Push for the Loans into Insolvency according Credit Suisse? 36) Which describes emerging market economy that is progressing toward becoming more advanced, usually by means of rapid growth and industrialization? 40) What is the name of the monetary value of all the finished goods and services produced within a country’s borders in a specific time period?